The logo of Maruti Suzuki India Limited is seen on a glass door at a showroom in New Delhi, India. (Photo: Reuters) Shares of automobile companies are riding high on the bourses with the S&P BSE Auto index hitting a record high on the BSE after the Maruti Suzuki India announced its September quarter (Q2FY18). 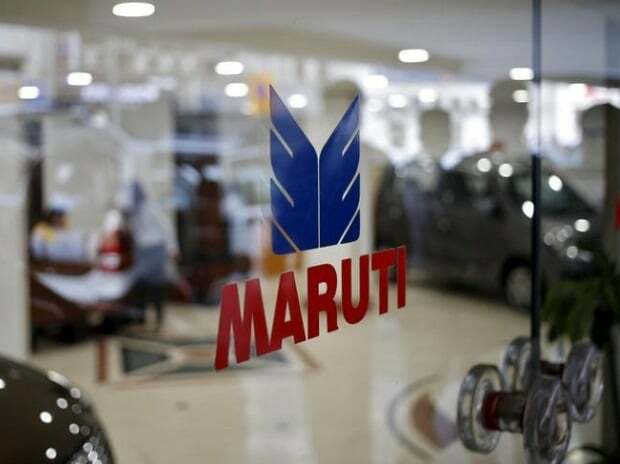 Besides Maruti Suzuki India, Tata Motors, Hero MotoCorp, Eicher Motors, Mahindra & Mahindra (M&M) and Bajaj Auto were up in the range of 1% to 3% on the BSE. At 02:27 PM; the S&P BSE Auto index was up 1.2% or 298 points at 25,390 as compared to 0.31% rise in the S&P BSE Sensex. The auto index hit a new high of 25,402, surpassed its previous high of 25,123 touched on October 18, 2017 in intra-day trade. Maruti Suzuki India hit new high of Rs 8,242, up 2% on the BSE in intra-day trade, after reported net profit of Rs 2,484 crore in Q2FY18, a growth of 3.4% over the same period previous year. The analysts on an average had expected profit of Rs 2,204 crore for the quarter. During the quarter, the company registered net sales of Rs 21,438 crore, up 21.8% over the previous year quarter. Operating EBITDA (earnings before interest, tax, depreciation and amortization) margin however declined 10 bps to 17.2% in Q2FY18 from 17.3% in Q2FY17. The company said lower operating margins was on account of impact of adverse commodity prices, higher advertisement and sales expenses. Analysts at Nirmal Bang expect double-digit earnings growth for Eicher Motors, TVS Motor Company, Swaraj Engines and VST Tillers for the quarter. The brokerage firm expects all companies in its coverage universe to report QoQ improvement in margins for 2QFY18 backed by a favourable low base because of GST implementation costs. Companies had also gone for price hikes in 4QFY17/1QFY18 which will also drive margin expansion for the quarter. JP Morgan believes valuation premiums will be sustained for market share gainers; hence, Maruti, Eicher Motors and M&M remain key overweight. Overall, we see improved volume growth prospects across the passenger vehicles (PV), 2-wheelers and light commercial vehicles (LCV) spaces for the year.